The previous post in our series on picky eaters discussed why kids eat the way they do. Now it’s time to step back and consider how the way we feed children impacts their eating habits and food preferences over time. One quick caveat. 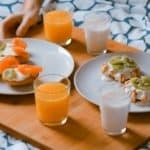 This article is not to meant to add to the already overwhelming guilt parents face when it comes to feeding their kids. Instead, the goal of this post is to help parents understand why certain feeding strategies fail and others flourish. When you understand the why behind feeding, it’s easier to make a change. Board Certified pediatric dietitian Angela Lemond, RD who blogs over at Mommy Dietitian, said the common feeding mistake she sees in her practice is short-order cooking. These are parents who make another meal when their kids say they don’t like what’s being served. In Child of Mine, Ellyn Satter’s explains it clearly: Making an alternative food so readily available tells your child louder than words can say, “I don’t expect you to learn to eat your meals.” Remember that your child wants to grow up with respect to eating, but she will take the easy way out if it is offered. In our last article we talked about how truly scared kids can be when it comes to trying new foods. So while you don’t want kids to dictate the menu, you also want them to look down at their plate and see something that is familiar. Christina over at Spoonfed blog said it perfectly in one of her comments: I’m not a fan of “eat-this-or-eat-nothing. So by offering the new items in addition to items you know the kids like (as part of the family meal, not by special order), you avoid that ultimatum while still exposing them to new foods. Parent: Do you want a turkey sandwich for lunch? Parent: Do you want a quesadilla? Parent: What do you want? child: The same Chicken sandwich we have at grandmas. Parent: We don’t have time for that. What do you want??? Young kids exert their independence whenever they can which may be why they tend to reply “no” to food offerings when asked. It’s much better for parents to decide what’s for lunch. Giving picky eaters the choice between two items works well. Feeding babies on demand makes sense but it doesn’t work for older children. First off, toddlers don’t always know how to communicate hunger until a meltdown implodes and older kids can use pretend hunger to get what they want (my daughter is always conveniently hungry when we go to Vons where they have free cookies). This type of feeding can also lead to grazing and poor behavior at mealtime. Jennifer from The Mommy Archives implemented planned meals and snacks with great results: One of my biggest issues with my little guy is that he would literally get up from the kitchen table and exclaim ‘I’m still hungry, can I have a snack?’ The first time I explained to him that I had a snack planned for him later he said ‘OK’ and walked out of the kitchen. It was literally that easy. Planning the snacks has set his expectation that next meal would indeed come and that he couldn’t just snack when he wants to. If you’ve been following the parenting literature, you’ve probably heard that over-praising kids can have negative effects on their motivation. An article in Parenting Science does an excellent job of summarizing the research in this area. In the article, Gwen Dewar, PhD, makes this interesting point about praising kids for doing what they love to do anyway. …suppose that Adam loves to eat broccoli. But every time he eats broccoli, his mom praises him for it. Consciously or unconsciously, Adam starts to question his motivation. Is he eating broccoli only for the praise? Adam changes his attitude toward broccoli-eating. It’s a chore, not a pleasure. If the praise ends, Adam loses interest in eating broccoli. As she discussed in the last article, vegetables are not naturally preferred by kids and take time to be accepted. Instead of pushing the veggies, parents can focus on making them attractive and available to kids. After all, studies show pressuring kids to eat healthy foods decreases their preference for such items. And which salesman are you more likely to buy from? The one who is in your face, pushing his product or one that sits back with an attractive looking product enjoying it himself? A while ago I was reading a blog where the writer admitted to making her kids eat more food, like veggies, in order to get dessert. She said she knew “the experts” say not do this but she does it because it works. Her kids eat their vegetables and that makes her happy. The question this mom needs to ask herself is will her kids eat vegetables when she is not around? Will they grow up liking vegetables or viewing them as obligation foods, like so many Americans do? 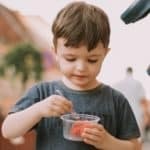 Research shows that this feeding strategy not only decreases kids’ preferences for the food they are made to eat (usually healthy fare) but it increases their fondness for the “reward” food. When I recently told a room full of parents that by one year of age babies can eat meals with the family most of the parents looked at me like I had two heads. I told them that the kitchen table is where children learn to eat and the sooner kids can get there the better. One of the moms from the class sent me an email after making the switch: My daughter is 13 months old and I was shocked to hear she should be eating with us, since she was still eating completely separate meals, very bland, usually pureed. I thought about what you told us and one night figured “what the heck” and gave her a chopped version of our adult food- she ate every single bite and loved it! Now we eat the same food every night, from curry to talapia to tacos. A reader wrote to me about making meals for her, her husband and her toddler: I need to realize though that a two year old probably will not be interested in plain, broiled fish fillets with steamed, unadorned broccoli. You may like your food cooked with little fat and sauces, but your child probably doesn’t. 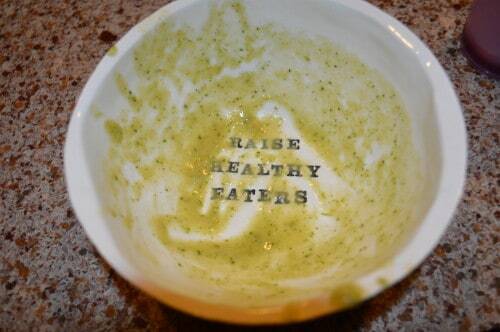 Remember, kids prefer energy-rich food so adding dips and sauces (even butter) can aid their acceptance of such foods. We’ll save specific strategies for our next post. The other day at the grocery store I saw a young girl pick up raspberries asking her mom to buy them. “Why do you want these? You NEVER eat raspberries when I buy them,” the mom replied in a stern tone. What the mom didn’t understand was that this is how children learn to like different foods. They see it several times, they show interest, they don’t eat if for a while, they try a bite, they don’t eat it for a while, they try it again and so on. She was telling her daughter she didn’t like raspberries but that wasn’t true. Her daughter was going through the process of learning, the same way kids learn to do other things like read and write. Don’t miss our next — and final — post in our picky eating series which provides proven ways parents can help their kids grow into good eaters. Thanks goodfountain. I appreciate it! Let me know how things go with your little ones. Thanks Jeanne. I appreciate it! Thanks! Great tips. I am a firm believer in the “same meal” rule–at least for dinner. I’ve fed our daughter what we eat for dinner since about 10 months. If she doesn’t eat it, she doesn’t eat. I know it seems harsh but she’s usually not starving for dinner and I want her to try new things. She does … eventually! Thanks Vanderbilt Wife! My daughter is also slow with the veggies although she loves carrots. All kids set their own pace. You also hit on a huge pet peeve of mine: telling kids they don’t/won’t like something. I see parents do this all the time, and it drives me nuts. Thanks Christina! Emphasizing food enjoyment is so important. We’ll be talking more about that in our next post. Great tips; thank you so much for sharing Christina…these are wonderful tips for my clients as I am going to refer them all to this wonderful post. Thank you, again; enjoy your weekend! OK. I need advice, encouragement. I understand all the directions to picky child eaters. I have a problem I didn’t see addressed and it’s important. I have a picky eater, she’s 11. She eats chicken, peas, broccoli, raw carrots and apples (only because I insist, it’s the only fruit she’ll, sort of, eat). I know all the tricks but because she also has a texture issue to food. Doesn’t really like any other meat. I try to HIDE things, like our pasta is ONLY Barilla Plus with flax, Omega’s and fiber and protein. But, a BIG BUT, she has focusing problems and I feel she isn’t getting all the BRAIN food she needs. She takes vitamins. She doesn’t eat much at sitting. She’s in the 10 percentile of her peers in weight. She has taken add/adhd meds but I can’t give them anymore to help the focus. It makes her NOT want to eat and it’s a amphetamine. I can’t hid berries is milkshakes because of the texture. She doesn’t like the cute ideas these great moms suggest, banana’s and peanut butter, etc. I want to just MAKE what we are having with a familiar item but how can I do that when she is so thin. I know it’s a guilt issue. Will she REALLY begin to eat what I make? Really? When she was 5 she must have choked on a chip or something because for a week she wouldn’t eat ANYTHING. The first 3 days NOTHING, the 4th day she began to eat only soft things. But she never gained her previous weight. Does anyone feel my pain? She is struggling in 6th grade, especially math. So, with focusing battles, picky eating and math troubles, should I really add ONE more major issue to her life? I need help here. And I need encouragement. I feel whipped on this. Thanks. I was reading an article about foods for picky eaters and focusing they were suggesting Tuna, salmon sandwiches, beans…OMG, please! Picky eaters don’t eat that stuff. Unrealistic. Oh, and by the way, I am a fairly healthy cook. I don’t have a lot of JUNK. And I don’t let the girls have desserts unless they eat something healthy for a meal. 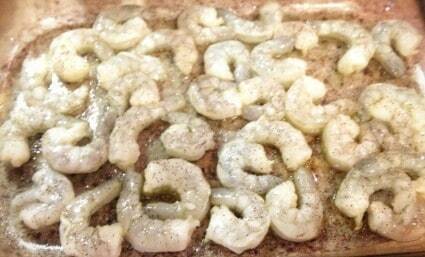 I use a lot of olive oil when cooking. I don’t keep sodas in the house. I usually home bake cookies. I don’t have the money nor the desire to buy cookies, etc. I try to balance their meals. I don’t make them eat everything I cook but I do try to put something they do like on their plates. My husband thinks I should just make what I make. The dr. says “I should” at least put one thing on the plate they’ll eat. One post said that we should make that one thing part of the meal. But we don’t want either broccoli, peas or carrots at every meal. I have vented enough. I am out of steam for now. Looking for an overhaul. Is there an eating camp to totally transform my pickies into awesome eaters. I know, I am grasping. Ha. Have a lovely day! Did you see the first article in the series? 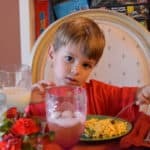 https://www.maryannjacobsen.com/2010/05/picky-eating-part-1-how-to-tell-if-your-picky-eater-needs-help/ You might want to consider getting your child evaluated. I’ll send you an email. I ran across this series today and I have a question. The method we have used in the past for mealtime is telling my sons how many bites they have to eat of whatever it is they don’t want to eat. If they do eat those bites they get dessert. They have gotten in the habit of asking at the start of the meal how many bites they have to eat. A lot of times it is the same as their age. From your recommendations this doesn’t seem like the best method. Your seems easier and less stressful but I would be concerned by kids would never eat their vegetable or meat or whatever it is they don’t want that day. For example, I know my middle son for lunch would eat his sandwich and pretzels and never bother to eat his fruit. Last night for dinner we had meatloaf, mashed potatoes, green beans and applesauce. My son ate his applesauce and refused anything else. At that point would you recommend to tell him when he is full he can be done and then give him dessert even though he only ate one thing? Thanks for the question. If you have been doing this for a while, once you stop and let your children decide what and how much to eat they will not eat the vegetable/or other food you have been making them eat. But after a while they will start to try and eat more of a variety. And when they do eat it, it will be because they want to not because they are told to. Kids don’t eat like adults do — they eat more of one food for a while, tire of it and then go to the next — this is how they learn. Instead of focusing one one meal or snack, consider how they eat over a weeks time. Offer fruits and vegetables often so they have more opportunities to eat them and there is less pressure at any one meal. By employing the division of responsibility, you are more likely to have children who eat well in the long run instead of children who eat food because they have to but then eat badly when you are not around. 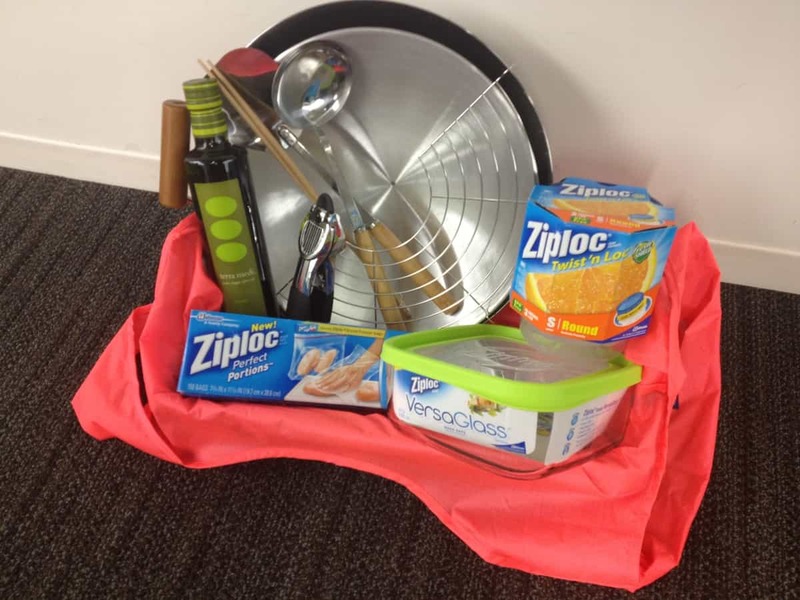 Your main job is to provide balanced meals and snacks — the rest is up to your kids. My next series on kids nutrition will help you discover whether or not your kids are meeting their needs and what you can do if they are not. Oh…and if they only eat a little at one meal, make sure you ask them if they are full and when the next meal is. That way they can decide whether to have more or not. I hope that helps! Thanks so much for the reply! So one more question… if my child says he is full after eating only some pasta or bread or something like that, do I encourage him at all to eat some veggies or fruit or just leave it be and say okay? I like the idea on another post of serving the dessert with the meal so it doesn’t seem like a reward. You can remind him about the other food, including the veggies, but if he says he’s done, he’s done. If he says he’s hungry later remind him to think about that next time. Thanks again! Have been trying this method for a few days. The only question that has come up is seconds. How do you handle that? Do you suggest giving seconds at any time of any food item no matter how much the kid has eaten? The issue I have is that my kids will eat what they want, sometimes leaving the fruit or veggie and then ask for more bread. Thanks! 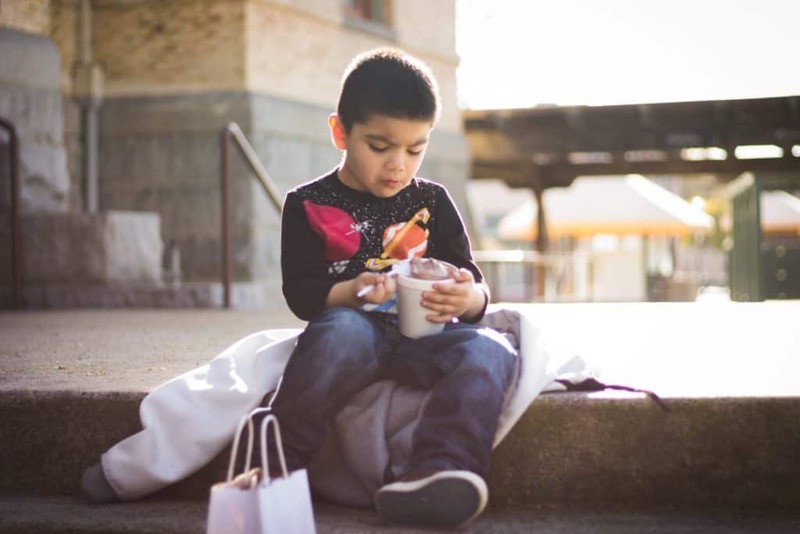 Great blog post and awesome series on working with kids that are picky eaters. Are these strategies still appropriate to use with older kids – say 10 years old and up? At what age (if any) do these strategies need to start being tweaked with new techniques? Any help that you can provide would be greatly appreciated!! Great article! With respect to kids eating separate meals for too long, we followed the Baby Led Weaning principles with our now 20-month-old. Since she has never had separate meals, she doesn’t know that they exist. Giving her our meals also really helped me pay attention to what my husband and I were eating as well, and helped me shape more healthy meals for all of us. Our daughter’s favorite foods are black beans, veggie tortilla soup, and bolognese sauce! Part of it is probably her nature too, but I credit at least part of her eating habits to starting with real food from the start. I enjoyed this article very much. My 2 year old tends to be a picky eater. I have a friend who is pushing me to force feed him. I am an RD an have told her that I will not do this and there is research that shows force feeding can cause eating problems in the future, which this article confirms. My friend would like to see the research. I cannot find it. I have been searching pubmed. Could you post some links to studies that showed feeding problems in children who were forced to eat food they did not want? Thank you so much for your help. Your style is so unique compared to other people I’ve read stuff from. I appreciate you for posting when you have the opportunity, Guess I’ll just book mark this page. Thank you so much for all the information and good advice. I have read your articles before and it did reduce some of the mealtime stress, but every now and again I find myself and my child in tears because I failed to apply everything you said. There is one issue that confuses me and I hope you can clarify. The context: I have a 3-year-old boy who has a very limited diet. A typical day is breakfast, where he has (or sometimes refuses) cereal with the rest of the family. Then lunch, which is our main meal. He will eat a certain brand of frozen spaghetti bolognaise or fish fingers, and that’s about it. I sometimes offer yogurt or bread with food that I know he won’t touch, and he usually eats that, but sometimes only one quarter slice of bread. Mince, mash, veggies, no matter whether sweet, raw, drenched in cheese or tomato sauce or naked, and all kinds of other foods get ignored, not even tasted or touched, and its been going like this for more than a year. Supper consists of noodles, which often takes some bribing, and… oh dear… baby food fruit or vegetables. The smoooooth kind. That is honestly the only fruit or veg he will eat and my compromise to ensure that he does get some vitamins and doesn’t go to bed hungry. My husband and I are not the best examples when it comes to loving fruit and veg, but we do eat some and have been offering it often if not three times a day for the past 2 years. Snacks are usually a rusk or yogurt. Now, my question: The advice seems to be clear – don’t cater to the picky eater. But also, provide something on the plate which you know he will eat. If I am setting out bread, yogurt or baby food next to the other ingredients of our main meal, knowing very well that he will eat that and only that and not touch the rest, isn’t that catering to him? Will he then ever learn to eat the other food? Any advice will be much appreciated. By the way, little brother is almost 18 months, and is mostly eating well … even some apple, peach, grapes, and pineapple – let’s hope and pray that it stays that way! Oh, and just to clarify: if I were to serve only the lunch I prepared for the whole family and it did not include one of those very few ‘likes’, he comes to the table, takes a look, says ‘don’t want it’ and leaves without touching it. Any effort to get him back to the table invariably results in a fighting lunch. Getting him evaluated with a feeding therapist such as an occupational therapist or speech therapist can rule out any oral/motor issues or sensory issues. You also might want to check for food allergies or other medical reasons why there are so few foods your child will eat. If you want to discuss more email me at raisehealthyeaters@gmail.com. For most kids it is sufficient to put a bowl of fruit or bread or another side they will eat but if you child eats so few foods there could be other issues going on. I love your tips and find them very helpful. All your articles are very practical, well written and useful. I find that a lot of parents struggle with this issue of picky eaters, and are looking for help. My husband and I started a blog to help parents with this very issue. We have learned a lot from you! Keep up the good work! Our son is 2 years 9 months. Until he was 18 mos old he ate everything that was offered to him ( kale, Brussels sprouts, etc..) with enthusiasm. Then suddenly he began rejecting almost all veggies & meats. Against my better judgement, I caved and catered to him with special separate meals. Although he chooses healthy foods ( prefers fruit to sweets), he is becoming more picky. We stopped catering & have been offering a variety of healthy options with 1 or 2 that I know he likes and letting him decide to eat or not. The problem that I have is if I offer a preferred food he will ask for 2nds or 3rds of that food without even trying the veggies or meat. I don’t like the eat what you are served or starve method but offering a preferred option at a meal has not resulted in him trying anything else. I involve him in meal prep, we are growing a garden, I let him choose ” would you like broccoli or carrots for lunch?”( he chooses but then won’t eat it), I try a variety of prep methods & recipes, we all eat together…. I just don’t know what else to do! He absolutely will not eat any veggies! I’d appreciate your advice! I just found your blog, and I really like it. When I was a kid, my husband and I had to sit at the dinner until we ate every bite. Fast forward, and I’m an adult who overeats. I realize I don’t even think about food. I usually concentrate on just quickly finishing what’s on my plate. Some of that even relates to working through lunch on the job. I knew I didn’t want to do that with my kids, but I was concerned that was being permissive but not forcing them to eat healthy. Recently, I’ve switched to many of the strategies you mention. I like your post on long term vs short term goals. Also, I liked where you mention foods for picky eaters. My son is the kind of kid who requests veggies for breakfast. He would prefer veggies over most anything. My daughter will eat veggies if smothered in ketchup or ranch. She does love fruit though, so I liked your fruit suggestions. She already likes many of the fruits you suggested, plus I always give the kids a multivitamin for good measure. I’ve stopped the short order cook thing and been better at providing healthy, planned snacks; however, I could work making sure I provide two familiar foods at each meal and serving food family style. My son even asked about this recently. He said, “Mom, I like how they serve the food at a buffet restaurant.” I’m going to try it. Thanks so much. Let me know if you have any questions!